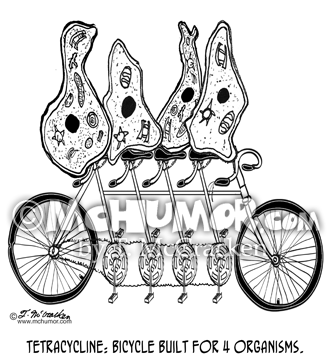 Bicycle Cartoon 8889: "Tetracycline: Bicycle built for 4 organisms." Four bacteria ride a bike for four. 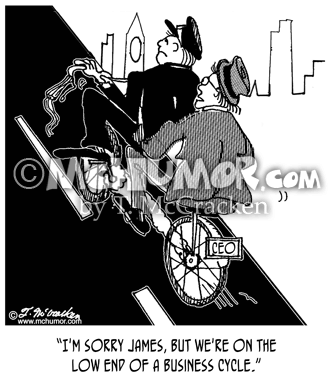 Bike cartoon 2435: An executive on the back of a bicycle saying to his chauffeur who's peddling, "I'm sorry James, but we're on the low end of a business cycle." 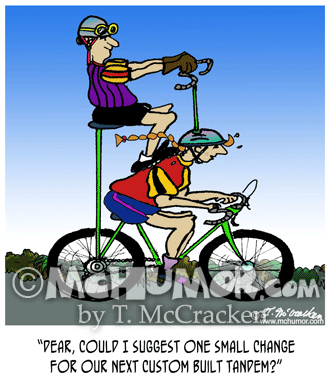 Bike Cartoon 1703: A woman on a bike where the second seat is above, not behind the first one saying to her husband, "Dear, could I suggest one small change for our next custom built tandem?" 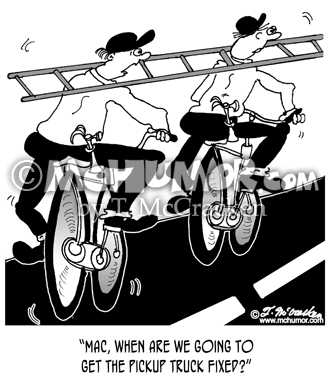 Painting Cartoon 6543: Men on two bikes riding down a road with an extension ladder over their necks. One asks, "David, when are we going to get the pickup truck fixed?" 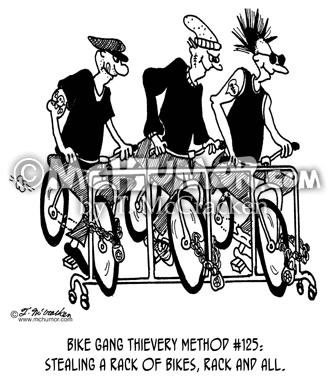 Bike Cartoon 4826: "Bike Gang Thievery Method #125: Stealing a rack of bikes, rack and all." Several thugs ride a rack of bikes still chained to a rack. 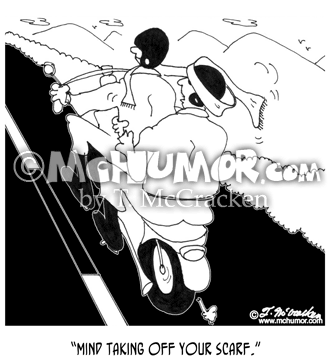 Motorcycle Cartoon 6874: A biker in back with a scarf wrapped around his face says to the driver: "Mind taking off your scarf." 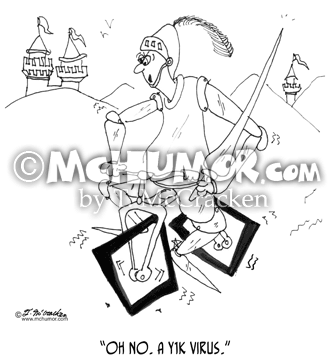 Bike Cartoon 6871: A knight in the middle ages riding a bike with square wheels says, "Oh no. A Y1K virus." 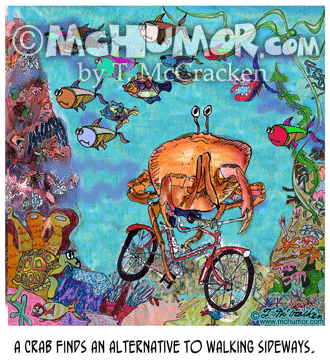 Crab Cartoon 8748: "A crab finds an alternative to walking sideways." A crab rides a bike under water. 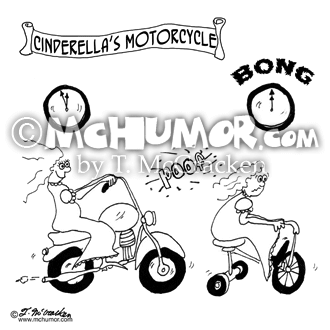 Motorcycle Cartoon 6997: "Cinderella's Motorcycle." A maiden rides a motorcycle that turns into a tricycle at the stroke of midnight. 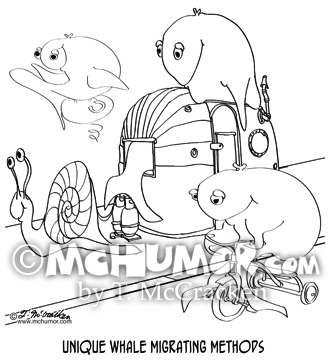 Whale Cartoon 8729: "Unique Whale Migrating Methods." A whale stuffed into a travel trailer is towed by a huge snail, a whale rides a tricycle and a whale uses a bouncy ball.